Instant Entertainment is a concept of providing relevant content for TV viewers based on recommendations. Customers “need not look, they will find” what they want to watch, what would be the most entertaining channel, show or movie at that moment. From the users' point-of-view the concept is realized in two separate but intrinsically interconnected features which are backed by a common recommendation system. These two features are presented via set-top-box browser application and built-in client interfaces. - Instant Tip Application – currently envisioned as an IPTV set-top-box browser application – for browsing and finding the right show among live TV programs. 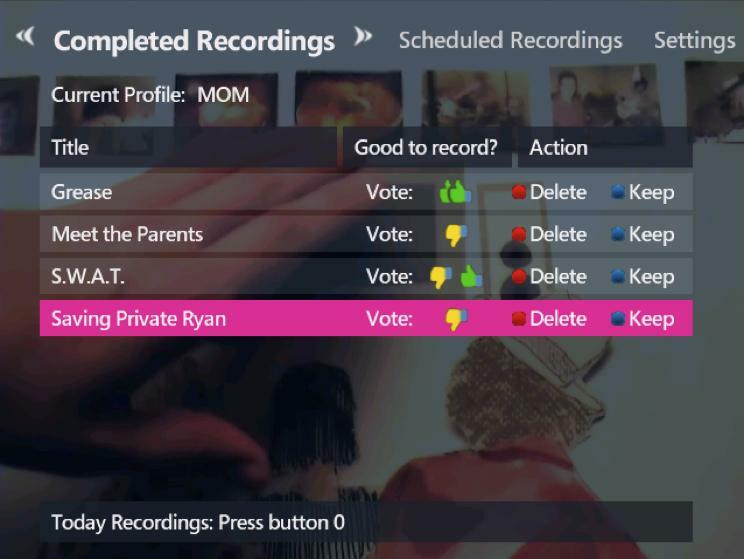 - Automatic Recording Application interconnected to and integrated with the built-in DVR capabilities of the IPTV service for managing automatically scheduled recordings. For both applications the aim is to create such intuitive and interactive interfaces that minimize user distraction and maximize the time spent consuming entertaining content. In this sense – on contrary to other interactive application – our goal is achieved when users spend as little time but as frequently as possible using these features since these applications are only the forefront of the main activity which is media consumption. Linear program (live TV) and video-on-demand (VoD) recommendations are presented to customers via an interactive IPTV MPF (Mediaroom Presentation Framework) application. The intuitive user interface lets users quickly browse (channel surf) through a number of highly relevant TV programs which are currently running or will be aired in a couple of minutes or are available in the built-in videotheque. For the user nine of the best fitting shows are recommended in a way that only three recommendations can be seen at the same time (plus the currently watched channel). The rest of the recommendations can be reached by the navigation buttons. The recommendation bar is sensitive to the up and down arrow buttons revealing two another rows of recommendations. 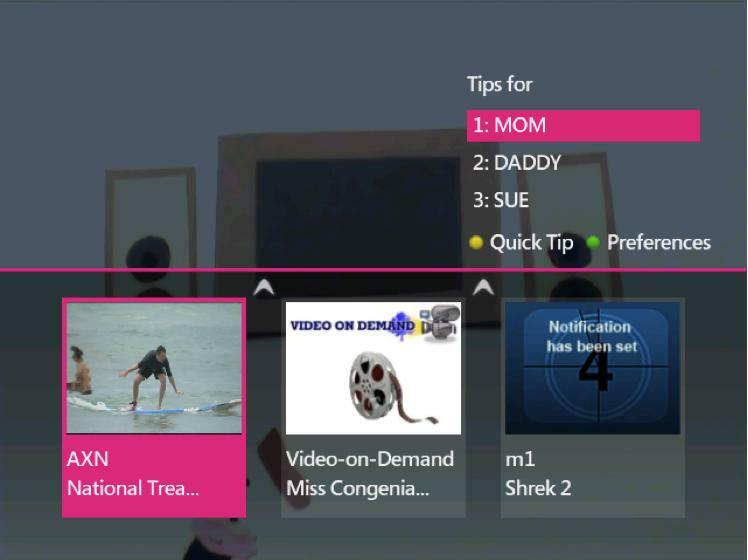 The first type of recommendations are based on program preferences (EPG information, genre). The second type is based on channel preference (brand affinity). These first two type of recommendations refer to currently running shows. The third type refers to shows starting in the near future or VoD offers in the VoD store. With this mechanism we get an intuitive, clean user interface which is not cluttered with irrelevant and distracting information, utilizes user feedback instantly directing the focus of the customer. In contrast with other solutions like multi-view (many PiPs) the limited number of choices at any moment with the interactive functionality to quickly access more options supports human decision process by reducing the mental stress caused by too many possibilities. In this case less is more. Secondly, multi-view implementations can only utilize channel numbers and/or favorite lists to create the order of preview screens which is just a bit better than surfing through a high number of channels in terms of wasted time. Instead, we provide the programs/channels in order of relevance based on the users' profile and interest. For further improving the recommendation algorithm on-the-fly the user interface allows more options to influence recommendations and system behavior. The person in front of the TV can explicitly choose from a number of profiles he or she had set up earlier for himself. This feature is an improvement on the built-in DVR scheduling feature of the IPTV service. It still relies on information coming from manual scheduling but the server-side component automatically schedules program recordings taking into account user preferences and media consumption habits. The system senses the available disk space and keeps it reasonably full with relevant shows that the customer probably would like watch or record. The user interface lets users manage these automatically scheduled recordings. They can rate, mark or delete recorded shows or future schedules. The application can list all recordings (past and future) and can differentiate between manually and automatically set programs. Thus it can be a full-fledged DVR management interface that leverages the Mediaroom built-in DVR functionality. The profile management tool is a common interface for both the Interactive Tip and the Automatic Recordings applications. This component lets the different TV users in the household customize their preferences. 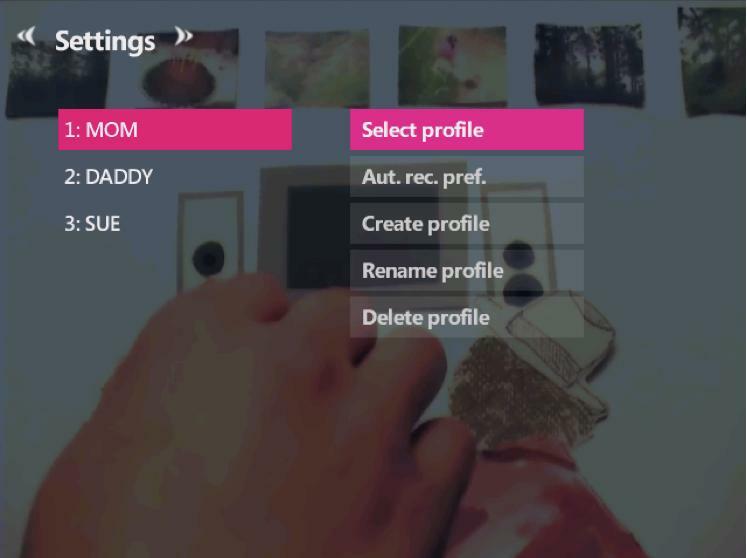 Most of the time it is not needed to explicitly set up profiles since profile creation algorithms are aware of multiple users in households and formulate clusters based on household's (set-top-boxes) watching habits. On the other hand if the habitants have completely different interests, the Profile Selection Tool significantly improves the quality of recommendations.